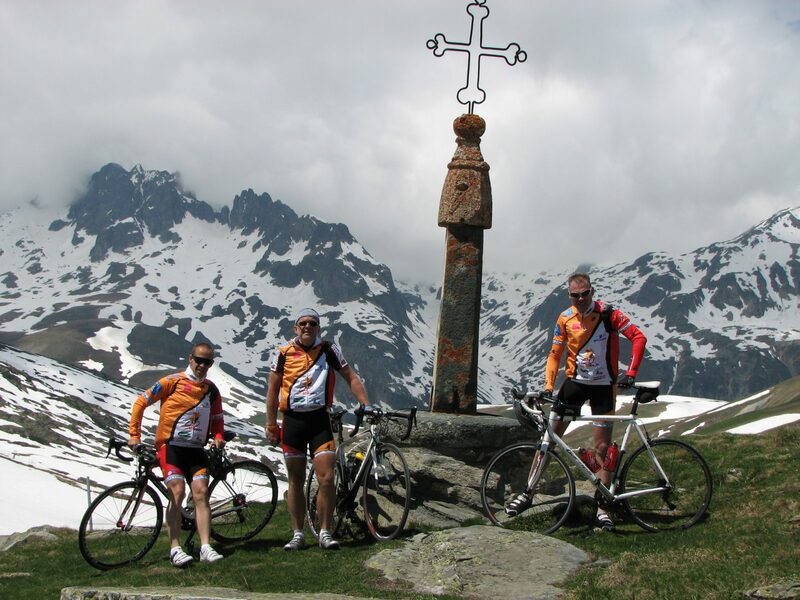 Between May 11 and 17, we were with all but one members of Team AD6 Tweets on a training camp in the French mountains. We were stationed in Les Ménuires – Réberty, 10 kilometers north of Val Thorens, a beautiful albeit almost completely deserted area, because the (winter) season ends mid-May here. Stefan and I went out for a first ride. From the apartment we headed down towards Moutiers, where we turned around to make our way back up again: a solid 1500 altimeters to ‘warm up’. And within five kilometers or so, I got hit for the first time this week. The legs were fine, but the ‘pressure’ on the upper body (back, ribs, diaphragm) made me crumble faster and more painful than in Berchtesgaden. At first I thought of fatigue from the long trip, combined with the oppressive heat, but the following days made it clear that this was not the reason. I finished the climb, but again not without halting/pausing to recover a bit. Saturday Ronnie and Werner (plus supporters) arrived, but since they were tired, we only climbed the last 10+ km stretch from Les Ménuires to Val Thorens. All in all a Saturday was a rest day while we were waiting for the rest of the team: Jeroen and his dad, Roelof and Marten – they were confronted with bad luck and (more) car trouble and did not arrive before the end of the day. The plan for Sunday was quite simple: just go back down to Moutiers and back up, but – for those who could handle it – continue all the way to Val Thorens. I was 5 minutes faster on the descent, but once I started to climb, the trip soon turned into the same ordeal as Friday. As another sign I was in trouble, I now could not even manage to keep my food inside – drinking was still reasonably okay, which changed for the worst later that week too. Nevertheless, I was stubborn (stupid) enough to complete the climb – plus the descent back to Les Ménuires, with the last 2.5 kilometers back up to the apartment as well. However, about 2 kilometers from Val Thorens, I was close to giving up, which obviously is against the motto of Alpe d’HuZes. After dinner I sat down to plot a nice route for the next day. The guys were eager to get to “La Plagne”, where Michael Boogerd won a Tour de France stage in 2002. I found a nice route there, avoiding main roads – a return trip was probably going to be a bit too much, as this would mean 140 km with the demanding destructive 34 km climb to the apartment at the end of the stage, but we would see. To avoid having to go through the tunnel between Moutiers and Aime, I planned the climb to Notre-Dame-du-Pre as a warm up: 750 vertical meters in 10 kilometer, but it did prove to be a beautiful route. The banana I ate for fuel was quickly dumped in the road bank, but actually this climb was not so bad otherwise. The descent towards Aime and the foot of the climb to La Plagne went well: from our starting point we would have around 17 kilometers of climbing to do, with 1,300 altimeters. Not really easy, but not too bad either and it proved to be a nice climb. Again, I had a lot of trouble sustaining myself and especially the solid food I could not hold. We then descended back to Aime, but the bikes were put in the car there. Given the pain and nausea, I concluded I had developed an inflammation. Given the nature of the injuries due to my crash, I suspected the intercostal muscles were inflamed, but I would have to deal with it. Stupidly, I had not taken any NSAID’s with me, because I was not expecting this and I only took my painkillers, like I did for the trip to Berchtesgaden. Luckily Stefan did have some and I guess it has helped me somewhat, although the damage was already done and I did not recover from it for the remainder of the week. Some pictures of the first days and the trip to La Plagne on my Google+ page here. It was not yet possible to cross the Madeleine by bike, but I discovered that evening that the Croix de Fer (information page here) had opened, so we could add that to the trip towards Alpe d’Huez. Quickly after the start of our ascent I had to let go of Stefan and even Marten. Stefan came back (or waited) for me a couple of times, but again as the distance increased I was irrevocably meshed into a pulp by the physics the effort. My legs were not the problem and I climbed with a heart rate of 130-140, which is quite (if not extremely) low, but at the risk of total collapse I was not able to get that up, so I could not increase my pace either. The poor bastards waited for me on top of the Croix de Fer; it was near freezing and I’m certain that it was no fun, but they could at least shelter, sit in the sun and eat/recover. Nevertheless, it is of course not good to do nothing at those temperatures and after Paula took some pictures of the three of us, we rapidly started our descent. However, the descent was so freezing cold that we had to stop for a while to warm up a bit, and during the (short) intermediate uphill section two-thirds down, I had to stop again and wasted the food I took in at the top. 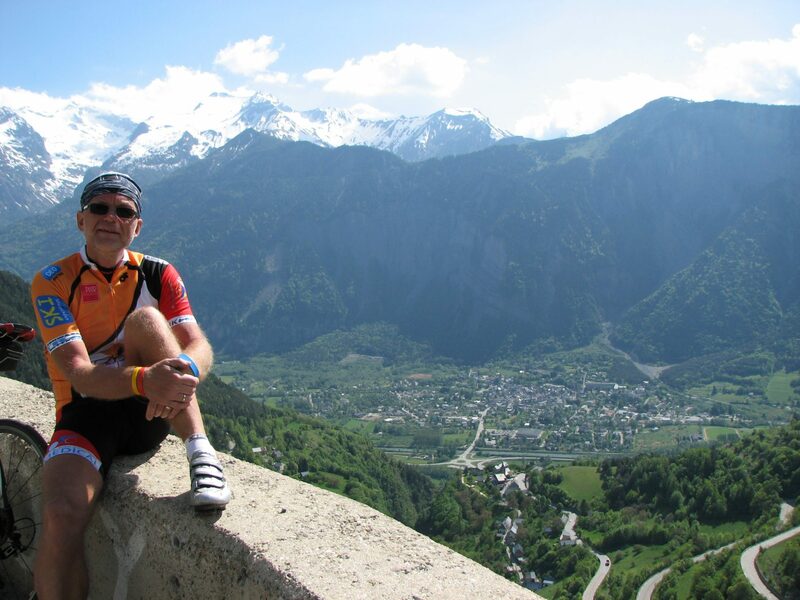 Since there was more space between the foot of the Croix de Fer and Le Bourg-d’Oisans than I expected – my usual lack of proper planning – we had ridden some 67 kilometers once we arrived at the foot of the Alpe d’Huez. Although it was the first time I undertook this climb, I knew that the danger lies in the first few kilometers. Not that I could have gotten much more out of myself at the time anyway, but I still forced myself to go up even ‘easier’ the first couple of turns. Is there life after half past dead? I don’t know, but to keep it short: I made it up, at least to the village. I forfeited the final 1,5 km to the official finish, because Stefan and Marten where waiting for me at the entrance of the village and the rest of the team – having done ‘only’ the Alpe – were already down in Le Bourg waiting for us to have dinner together. I do not remember much of the descent by car and once down we found the others and searched through the village for a place to eat. Since there was nothing much going on, we eventually ended up in the ‘luxury division’ of Snack bar Cor, called Tête de la Course where you can at least have some pasta. Wednesday was initially marked as a ‘rest/recovery day’ by some, but whomever wanted was of course free to find another challenge. Stefan and Roelof (and one or two others?) went for the alternative climb Moutiers – Val Thorens (the road less traveled) and if you think I opted for R&R, think again. 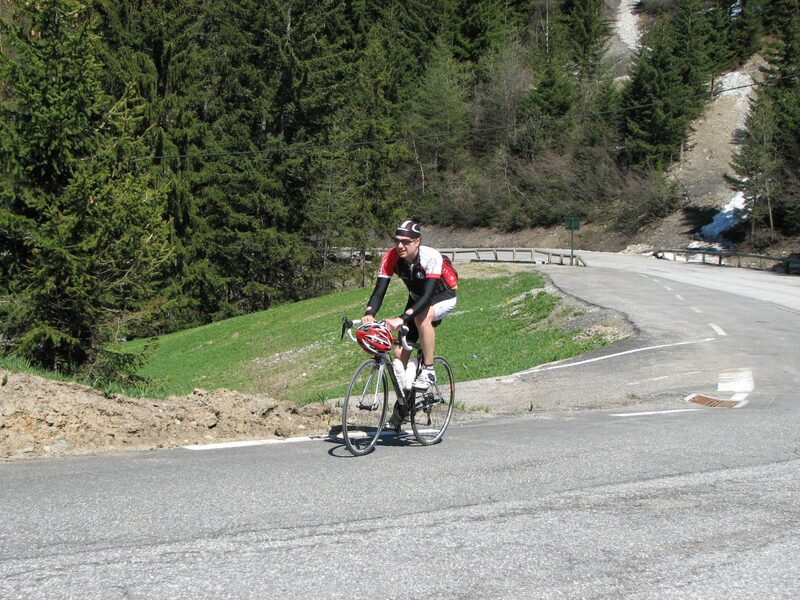 I decided to go for the climb of Les Arcs – I really wanted to go up the Col de l’Iseran, but I figured that would be asking for too much trouble… The transfer to Bourg-Saint-Maurice was done by car, as by now I knew better than to try to get there by bike, the same route as Monday. To my surprise, I found out that the road itself and the tunnel I avoided then, were actually not that bad after, so I could have cycled to Bourg-Saint-Maurice after all. 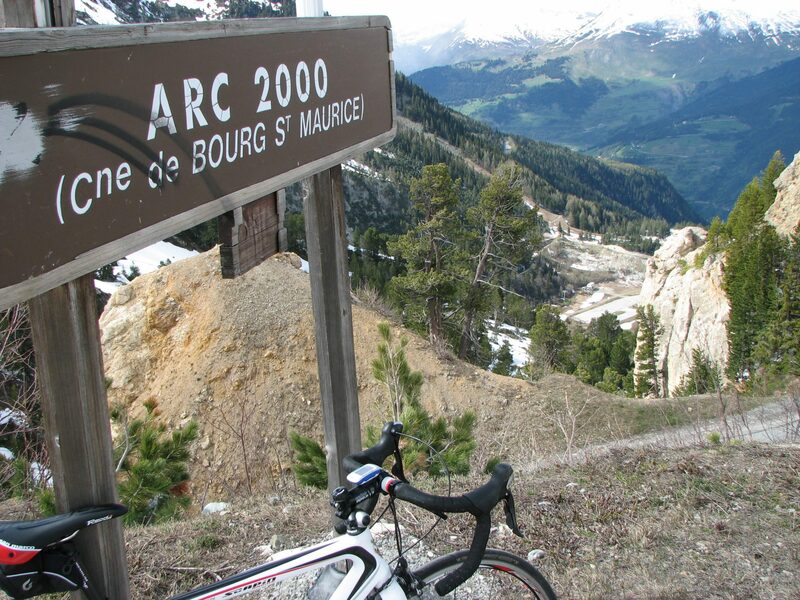 Anyway, the climb to the highest Arc resort (Arc 2000) is already about 25 kilometers long, though there are ‘only’ 1,300 altimeters to be overcome. Since I was all alone – other than my guide Paula – I felt less guilty if it would take me longer. But it actually did not go all that that bad today, although it was pretty cold. Only the last five, six kilometers were really difficult in terms of effort (pain). I had to take a break and I was eventually glad that I arrived at the Arc 2000. Going down on the bike did not seem to be that smart given the cold, (like everything else I did this week was not so smart), so we descended by car to Bourg and had a coffee on a terrace. You can find some pictures of this endeavour on my Google+ page here. And that was the end of it – on Thursday we only thought of another trip. The others left early anyway and even though we hadn’t planned to leave before noon, Stefan and I had also had enough. You have to go 30+ kilometers down to Moutiers to be able to get some climbing done. Or alternatively, we could just do the 10+ kilometers up to Val Thorens, but that also didn’t look that appetizing. Conclusion? Does not seem sensible… If there is a persistent inflammation – which may well be the case – then Alpe d’HuZes becomes “Mission: Impossible 6” I’m afraid. I’m pretty sure I’ll get up the Alpe the first 2, 3 times (way) better than last Tuesday, but 6 times seems not feasible under these conditions. If by chance a miracle happens, then at least I know my legs are fine and it will be a different ball game altogether. I refuse to resign in advance, even if the doctor tells me to do so. And, if even for myself, I have spent the past week finding out that the ‘grinta’ is there (or should I say ‘is not lacking’?). Which, in a nutshell, is the essence of the Alpe d’HuZes, right? But it makes no sense killing yourself in the process of a fund raising event, which is aimed at saving lives.